Basalt has a wide distribution in the world, and it is an important component in the earth's crust. Basalt takes advantages of fine, strong compression resistance, low crushing value, strong corrosion resistance, wear-resisting and asphalt adhesion, which make it become the bast material for highway, railway and airfield runway construction. 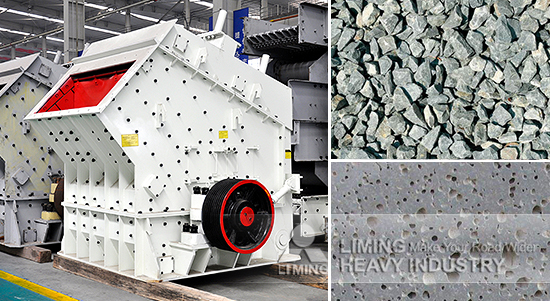 Impact crusher made in Liming Heavy Industry is special equipment for processing basalt, such as coarse crushing, medium crushing, fine crushing and superfine crushing. This impact Crusher is made of quality raw materials, and it adopts world-class technology, unique design of rotor, unitary cast steel bearing seat and hydraulic adjusting device. There are many kinds of crushing chambers provided for you, which can solve different problems easily.